Gillingham picked up a much-needed boost ahead of this weekend’s home clash with Luton after a thrilling FA Cup win at National League side Hartlepool on Wednesday night. The Gills had to make the long trek after drawing 0-0 at home and were staring at a cup shock with 32 minutes on the clock, trailing 2-0. However they pulled one back early in the second half and then won a penalty in the 90th minute, converted by Tom Eaves to force extra time. Eventually, their class shone through, winning 4-3 as they host Slough Town in the next round, with boss Steve Lovell saying: “I’m just delighted we are through because it’s a banana skin coming to places like this because we are expected to win, and the boys showed great character. The success was a rare bright moment in what has been another season of struggle at Priestfield after avoiding relegation by a mere six points last term. Losing 1-0 at Oxford last weekend saw the Gills dragged right back into another potential fight for survival this campaign, as they are just one point above the drop zone. 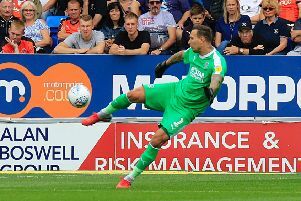 It had looked like the club’s fans could have cause for optimism back in August, with Gillingham beginning in excellent form, winning at Accrington and then defeating Burton Albion to start with a 100 per cent record. However that was to prove a huge false dawn, as they quickly went on a downward spiral, with a miserable run of eight games without a win, taking just a couple of points with two draws and six defeats. Remarkably, Gills got back to winning ways with a coupon busting 2-0 success at leaders Portsmouth, although no immediate improvement followed, hammered 4-0 at home by Spurs U21s in the Checkatrade Trophy and then losing to Southend in the league. A 3-3 draw at Doncaster earned another unlikely point, before losing 3-1 to Plymouth, which led to chairman Paul Scally offering all 254 fans who made the midweek trip free tickets to a forthcoming home game. Gills have picked up slightly of late, especially on home soil, beating Bradford 4-0 and Fleetwood 3-0, although missed the chance to complete a perfect trio, beaten 1-0 by Blackpool. Team news: Striker Danny Hylton sits out the final match of his suspension, while Luke Berry (knee) remains out. For Gills, manager Steve Lovell confirmed Dean Parrett, Josh Parker and Callum Reilly are all available. Top scorers: Hatters – James Collins (7). Gills – Tom Eaves (12). Man in the middle: Kevin Johnson. Has taken 19 games this season, showing 55 yellows and two reds. Refereed Luton once, the 3-2 win over Scunthorpe in October, while had the Hatters twice last year, a 2-1 win over Mansfield and 1-0 defeat at Barnet. Prior to that, officiated the Hatters in a 1-0 EFL Cup defeat at home to Leeds United and 1-0 loss at Mansfield in the 2015-16 season. Was in charge of Luton plenty of times during their Conference days, with wins over Mansfield (sending off Callum Reynolds), Stockport, Forest Green, Woking, Barnet and Kidderminster (twice), along with a draw at Cambridge and home defeats to Mansfield and Kidderminster. Assistant referees are Carl Fitch-Jackson and Daniel Cook, with fourth official Paul Lister. In charge: Steve Lovell – started his career with Crystal Palace in 1977, as he played 74 times for the Eagles, before spells with Stockport County and Millwall. Sold to Gillingham for £20,000 in 1986, netting over 100 goals in 200 matches, finishing as the club’s leading scorer in four consecutive seasons. Dropped into non-league in the 1990s, named player manager at Sittingbourne in February 1995. Left in September 1996, while spent a year in charge of Gravesend & Northfleet, hanging up his boots in 2001. Had a spell as football in the community officer for the Gills, returning to management with Hastings United in 2003 and had another stint with Sittingbourne between 2005 and 2007. Left to take over at Ashford Town, staying until the club’s demise in August 2010, heading back to Priestfield in December 2014, named co-caretaker manager alongside Andy Hessenthaler, Darren Hare and Mark Patterson. Remained at the club as first team coach when Edinburgh took sole charge, leaving in May 2016 to become assistant boss at Bromley. Was back at Gills once more though as a coach in January 2017 under Adrian Pennock, taking over as caretaker boss once he was sacked, winning four from seven, named permanent manager in November 2017. View from the opposition: Steve Lovell talking to Kent Online: “It could be 8-8. Nathan is a nice lad, a good coach and well organised. He has got his team playing. “He was brought up with the same mentality and did the U23s at Charlton while I was doing the U18s and Paul Hart was there. “Paul wanted to play the diamond or 4-3-3 and I think that is where we both picked it up and went with it. “Nathan is playing that way and he has got it off to a tee. “It will be interesting and it will be open. We have scored quite a few goals ourselves this season and it should be a good game. I don’t think it will be 0-0. “You can’t go up against teams like this and think we are going to do a Hartlepool and sit behind the ball and try and get a 0-0 or nick it 1-0. “Plymouth tried to stop Luton playing last Saturday but they couldn’t do it. “I am looking forward to the game because it is against the team that are one of the favourites. “A lot of managers who I speak to and ask who the best team they have played against say Luton. Friendly faces: Town attacker Harry Cornick had a brief loan spell at Gillingham from Bournemouth in the 2016-17 campaign, making six appearances but failing to score. For the Gills, centre half Alex Lacey came through the ranks at Luton playing 51 times and scoring once. Released in July 2015 and headed to Yeovil where he made 72 appearances, scoring four goals before joining Gillingham in May 2017. Has featured just 24 times for his new club, scoring twice, including in the 2-0 win at Portsmouth in October. Played for both: Dean Brill. Born in Luton, the goalkeeper came through the ranks at Kenilworth Road, making over 80 appearances during his first spell. Was loaned to Gillingham in December 2006 for a month, playing eight times for the Gills in League One. Had spells with Oldham and Barnet after leaving the Hatters, moving back to Luton in August 2012, featuring in a handful of games, as he left the club with 109 appearances to his name. Moved north of the border to sign for Inverness in 2013, and then had spells with Motherwell and Colchester United. Back in England permanently now though as goalkeeping coach with Leyton Orient, while he is the current number one for the O’s, playing 20 times as they sit top of the National League. One to watch: Tom Eaves. 26-year-old striker who started at Oldham and had spells with Bolton, Bristol Rovers, Shrewsbury, Yeovil and Bury before heading back to Yeovil permanently. Stayed for two seasons, released in the summer of June 2017, heading to Gillingham on a free transfer where his career has properly flourished. Scored 18 times last term, including two hat-tricks and has lost none of his eye for a goal this campaign up to 12 already with recent braces in the wins over Bradford and Fleetwood. We’ve got form: Luton had a great start to matches at Gillingham with three wins in the United League and Southern League fom 1905 to 1919. They also had a six match unbeaten run from 1931 to 1936, but recently Gills have had the upper hand, winning five games in a row from 1998 to 2008. That was ended when Sam Parkin scored the only goal in a 1-0 League Two win back in August 2008, which was Town’s last league visit. In total, Luton have won 14, drawn six, and lost 16 of their 36 trips, scoring 41 and conceding 49. Results are usually guaranteed too, with no draw in their last 16 visits since a 1-1 Division Three South scoreline, over 80 years ago, in 1935. Last time out: Luton picked up an excellent 2-1 win at Gillingham in their most recent visit, that a Checkatrade Trophy group stage tie back in August 2016. Picking a side full of youngsters, Luton went in front on 10 minutes through Frankie Musonda, with Jonathan Smith adding a second 14 minutes later. Town then held out, with Darren Oldaker pulling back a late consolation in the final minute, as Luton sub Connor Tomlinson became the club’s youngest ever player with his late sub appearance. Hatters: Craig King, Kavan Cotter, James Justin, Frankie Musonda, Akin Famewo, Jonathan Smith, Jake Gray, Tyreeq Bakinson, Zane Banton (Connor Tomlinson 89), Josh McQuoid (Alex Atkinson 84), Isaac Vassell. Subs not used: Liam Gooch, Harry Bean, Jack Snelus, Arthur Read, Freddie Hinds.